You may download my thesis here, it is about 59 MB. Maybe you prefer it in its original B5 format? If you just want a “short” overview, please continue reading. 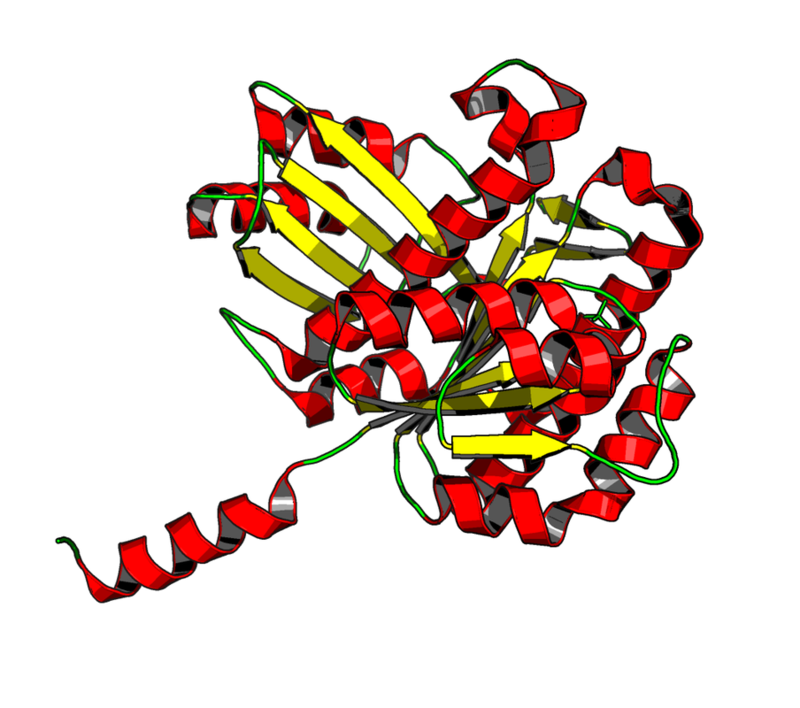 FtsZ is a protein we can find in prokaryotes. It is present in bacteria, archaea and even chloroplasts and some mi­to­chon­dria (both believed to have a pro­ka­ryo­tic origin through symbiotic events in the early days of life). FtsZ is an old relative of animal tubulin, although it is more similar to actine in function—as far as we know. When prokaryotic cells need to divide they gather a complex of proteins that form a constriction ring in the middle of the cell. The first protein identified in this system was FtsZ, which was given the name Filamenting temperature-sensitive mutant Z, because mutations that affected this protein impaired the division process and produced very long cells. We know that FtsZ needs other proteins, FtsA or ZipA, to bind to the cellular membrane, and suspect that the Z-ring is responsible for producing the forces needed to split the cell in two. However, the process is yet very far from being understood, and we lack a satisfactory model to describe the division event. As one can imagine, the complete picture is much more complicated than the simple description I have hinted above , even if we do not consider all the other systems and reactions that are taking place simul­ta­neously in vivo. For this reason, we need simplified approaches to help us unravel the cell-division mystery. 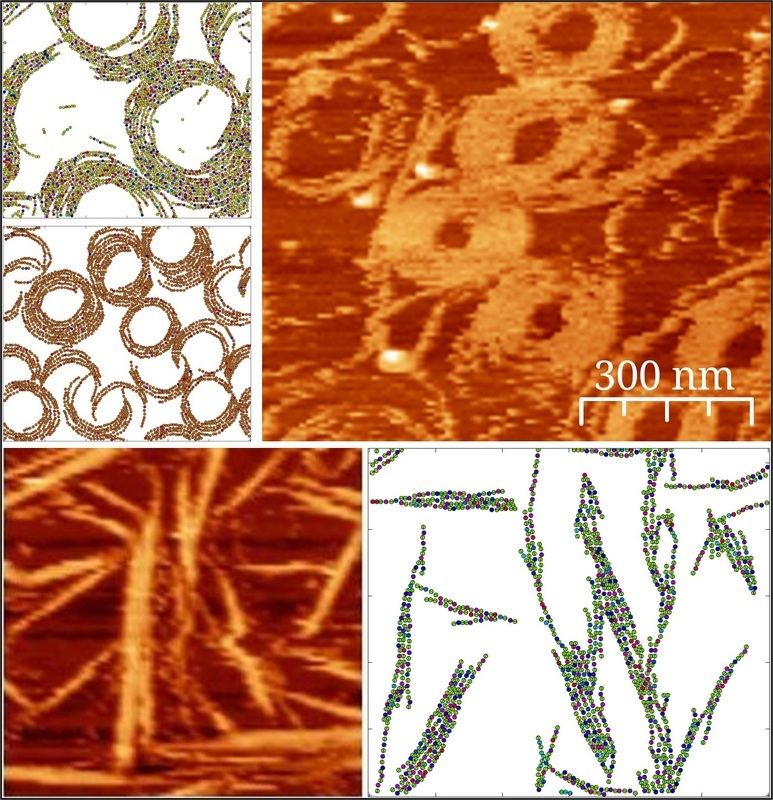 We are working in close collaboration with the group of Marisela Vélez, who provide atomic force microscopy (AFM) images of FtsZ filaments anchored on flat surfaces. The advantage of this approach is that it greatly simplifies the experimental conditions, so that we can better understand FtsZ properties and then extrapolate that know­ledge to more complicated situations. 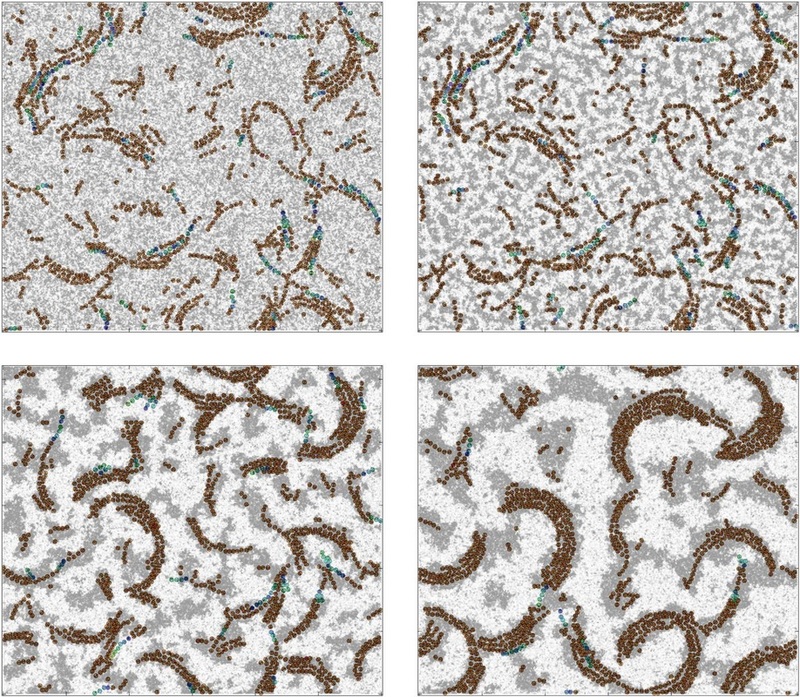 However, AFM images proved too difficult to interpret by direct observation, specially considering the highly dynamic nature of the filaments, which continuously break and rearrange. Our goal is to develop simple models containing only the truly essential interactions between FtsZ monomers which can explain the AFM observations. The idea is that, if you are able to reproduce the results with only a few parameters, then the other interactions and details are not as essential at that level; this is very helpful information for biologists. We test our models in Montecarlo simulations. The basic version of the model considers a longitudinal bond between monomers of similar orientation on the surface. This bond can have some curvature (with an energy cost depending on the direction of curvature). There is also a weaker isotropic (unspecific) interaction bet­ween monomers which promotes bundling. The monomers live on an hexagonal lattice finer than the proteins so that it allows for small steps in movement that will not necessarily break protein bonds . In this image we see how experiment (a) and simulation compares. Snapshot (b) is missing the weaker isotropic interaction and also allows the filaments to overlap each other: the results are a clear disaster. In snapshot (c) we have excluded area, that is, filaments cannot cross over each other. 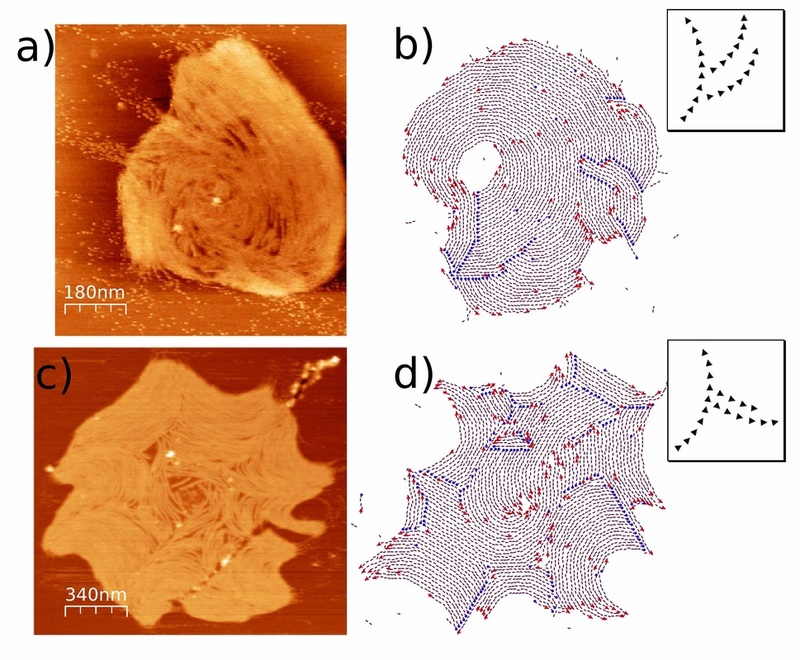 The results are better, but we see how the weaker unspecific interaction is also needed to explain the aggregation of the filaments in more complex structures (d). In (e) we are missing curvature. In this way the model was used to identify the most basic properties of FtsZ filaments: longitudinal bond, isotropic weak interaction and curvature. My first research objective was to understand new aggregates that were being observed. The group of Marisela Vélez had begun working with FtsZ mutants that can directly bond to a lipid bilayer without need of FtsA or ZipA. These mutants offer some control over the orientation of the monomer with respect to the surface. The new experiments produced qualitatively new structures that could not be reproduced with the model above. We considered a new interaction at specific angles between two monomers, not as strong as the lon­gi­tu­dinal bond, not as weak as the iso­tro­pic inter­ac­tion. 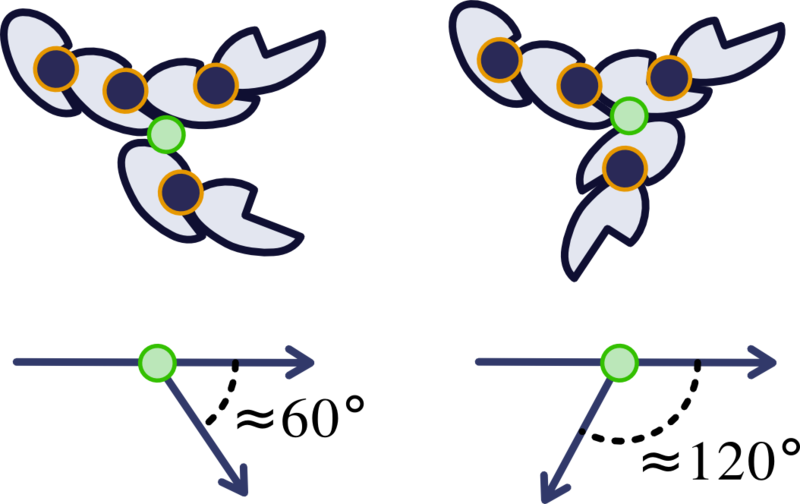 This new interaction, called Strong Lateral Bond (SLB) can assume different variations in order to account for the different experimental conditions . 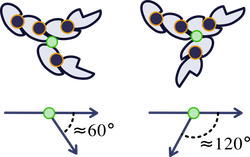 In this image we can see two different ex­per­i­mental set-ups, (a) and (c), and the new ag­gre­gates that are formed. In par­ti­cu­lar (c) is rather different from previous aggregates. Beside them we can see the results of the si­mu­la­tions in­clud­ing the new interaction, SLB, with the specific configuration shown in the inset. In this project we also studied the impact of the initial conditions of the system on the final aggregates, which can also affect the shape of the aggregates. ​will not happen in the older version of the model. When an specific anchoring angle is favoured, all the monomers want to have the same angle with respect to the surface. If the filaments have a twist, this torsion will want the angle with respect to the surface to change from one monomer to another. Thus a competence arises and several compromises can be found—you can either sacrifice torsion and have well-anchored filaments (with a nice natural curvature) or you can prefer to sacrifice a bit of anchoring and have filaments with torsion, which will look straightish from a distance (like a stretched spring). This was also suspected by other groups analysing other conflicting data . 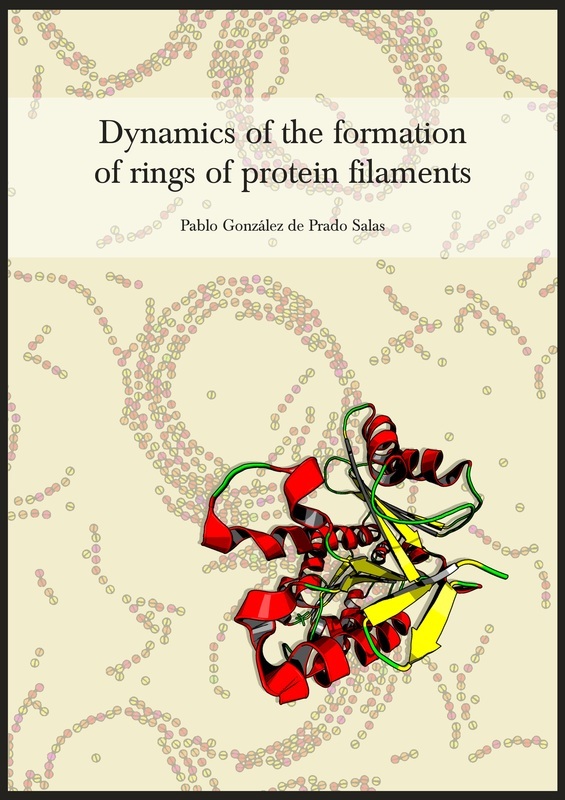 Molecular Dynamics studies by the group of Paulino Gómez-Puertas showed an FtsZ helix. From these simulations we extracted the bending and torsion angles of the bonds, as well as their variations. We used that data to build a model for the bond which could include the new torsion angle, and we studied how the bonds of the helical filament would behave if they were forced to remain on a surface (as in the experiments). The new model predicted different results depending on the anchoring conditions: for a strong anchoring with the bending plane parallel to the surface we find filaments with high curvature. If the anchoring angle is perpendicular (so that filaments try to curve outwards from the surface) we find straight filaments and, in the case of a weaker anchoring, we see how torsion produces seemingly straight filaments. If we analyse the flexibility of the filaments by measuring the direction of each mo­no­mer, loosely-anchored filaments would appear to be more flexible, which could explain some previous observations regarding the flexibility of FtsZ filaments on different substrates. According to this model filaments will produce some stress on the surface depending on the preferred anchoring angle, and this could contribute to the generation of force in the division of the cell . After the previous exploration of the model in ideal filaments, we implemented the new bond model into the fine-grained model for Montecarlo simulations. We see how FtsZ filament-rings increase their curvature as the anchoring angle changes, up to the point when open filaments with different degrees of curvature are found. This more complete model also produces coexistence between long and short filaments, which is always observed in AFM images but was elusive in the results from the simpler model. Under certain experimental conditions the different lipids used for the mem­brane segregate and form domains. This results in an unexpected polymorphism of the protein aggregates which cannot be explained by the previous model. 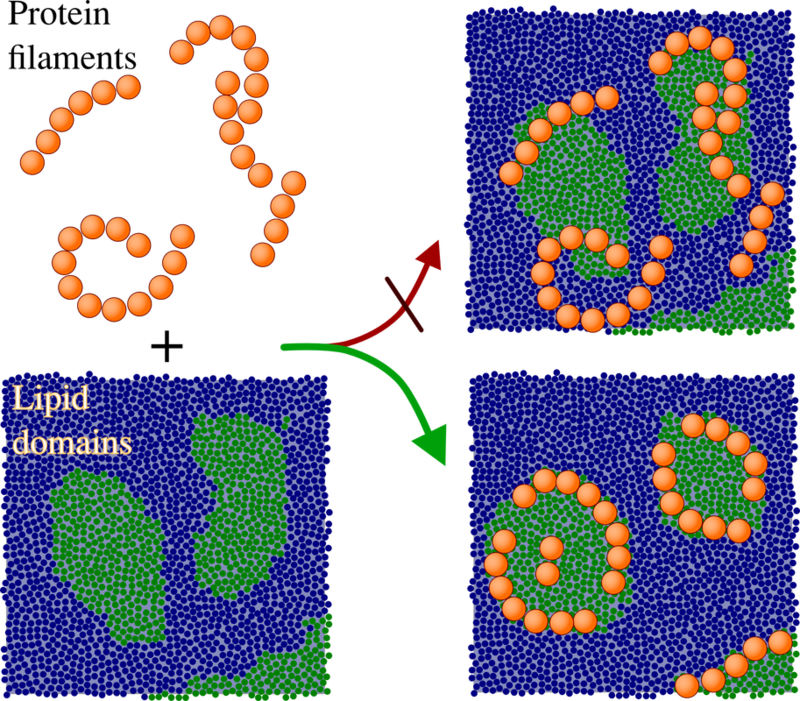 Previous attempts to describe lipid domains have included proteins as a rigid scaffold to guide lipid segregation . In our case the proteins are clearly playing a more dynamical role. For this reason we modified our fine-grained lattice model so that it could include two different lipid species (an anchoring lipid and a neutral lipid). Each cell of the lattice will now have a lipid density accounting for the mixture of anchoring and neutral lipids at that particular point. Lipids tend to segregate to minimize the energy of the system, while entropy tends to mix them. Temperature will decide which factor is more important. We also included an interaction between monomers and lipids, representing the fact that monomers need one of the two lipid species to correctly anchor to the substrate. On top of that, anchoring is a plausible mechanism for constriction-force regulation. Filaments attached with a natural bending orientation on the plane surface will not produce constriction forces, as will do filaments attached in a perpendicular (off-plane) direction. Torsion and anchoring have antagonistic roles, since well-anchored filaments cannot have torsion. This results in richer aggregates. Subtle variations in the anchoring conditions can thus drive qualitative changes in the system. This may be exploited to regulate the division process. 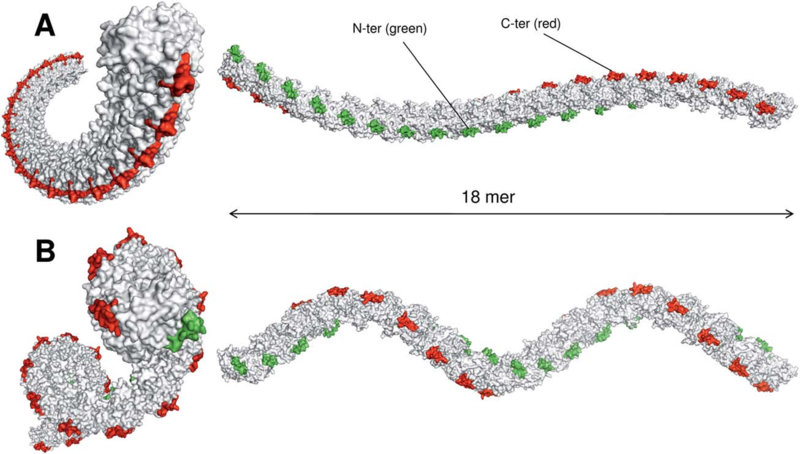 Other features we have studied (SLB, lipid segregation) would seem to have an auxiliary role in the FtsZ dynamics, perhaps triggering the transition between different aggregation states or localizing and stabilizing the Z-ring, collaborating in this way with the regulation of the division process. Vicente M, and Rico A. The order of the ring: assembly of Escherichia coli cell division components . Molecular Microbiology. 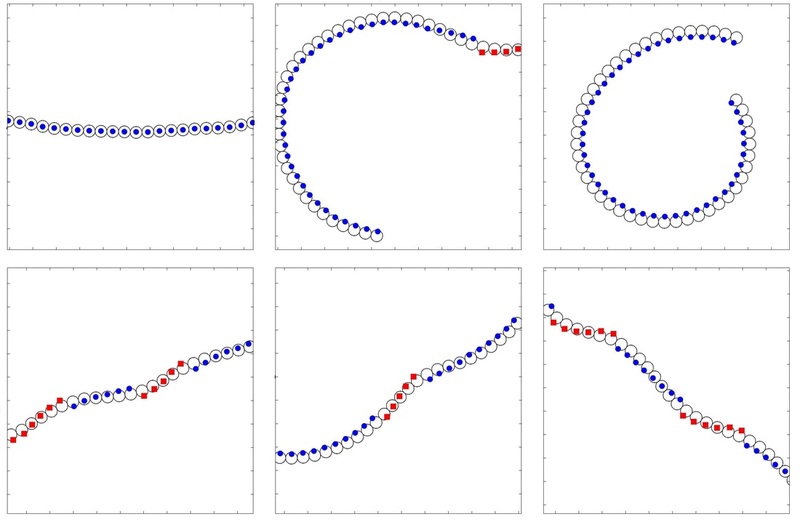 Paez A, Mateos-Gil P, Hörger I, Mingorance J, Rivas G, Vicente M, Vélez M, and Tarazona P. Simple modeling of FtsZ polymers on flat and curved surfaces: correlation with experimental in vitro observations. PMC Biophysics. González de Prado Salas P, Encinar M, Vélez M, and Tarazona P. FtsZ protein on bilayer membranes: Effects of specific lateral bonds. Soft Matter. Arumugam S, Chwastek G, Fischer-Friedrich E, Ehrig C, Mönch I, and Schwille P. Surface Topology Engineering of Membranes for the Mechanical Investigation of the Tubulin Homologue FtsZ. Angew. Chem. Int. González de Prado Salas P, Hörger I, Martín-García F, Mendieta J, Alonso A, Encinar M, Gómez-Puertas P, Vélez M, and Tarazona P. Torsion and curvature of FtsZ filaments. Soft Matter. Ehrig J, Petrov EP, and Schwille P. Near-Critical Fluctuations and Cytoskeleton-Assisted Phase Separation Lead to Subdiusion in Cell Membranes. Biophysical J.